Are you in the market for an entertainment center? Why just settle for a simple, run-of-the-mill entertainment center when you can get a truly dazzling fireplace and media center combo? Have a warm, sharp-looking fireplace right under your TV stand and light up the room with more than just your television. What would be more awesome than a fireplace that doubles as a media center, so that you get all of your ambiance, warmth, and entertainment in one place? Why, a fireplace entertainment center that has a classic look and wood finish, so that you don’t have to sacrifice the traditional look in order to display your modern luxuries. That fireplace is the Better Homes and Gardens Media Electric Fireplace Ashwood Road. It is everything you need in a media fireplace, with great looks on top of that. The wooden platform of this entertainment center is more than sturdy enough to hold up most flat panel LCD televisions, and it can bear the weight of up to 100 pounds. As far as width goes, it can carry a TV that is up to 45 inches wide. Under the top platform is a little shelf where you can store your other media devices, such as your Blu-ray players, cable boxes, or video game consoles. Doors on the sides of the cabinet open up to reveal storage space for your movies or other optical-disk-based media, your video game cartridges, print books, or just any old knick-knacks that you want to keep organized. The fireplace itself is quite powerful and can heat up a room of up to 400 square feet. It has a thermostat with 20 degrees of range, so you can set the temperature that you would like the heater to keep the room at, and the fireplace will maintain this ambient temperature. If you wish for the device to turn off automatically later on—for example,after you have gone to sleep—you can do this too by setting a timer. This is a 1400-Watt electric fireplace. The flames are adjustable just like the temperature, and there are four intensity settings for you to choose from, as well as a setting for no flames at all. You can adjust all of this with a remote control no matter where in the room you happen to be lounging and enjoying your fireplace. This fireplace also comes with a 1-year warranty, in case the unexpected occurs to your new purchase, so you can buy with peace of mind. 47 x 30 x 18 inches in size. About 124 lbs in weight. Storage space in the cabinet. Will heat a room of up to 400 square feet. Looking for a large media center / fireplace combo that has an attractive, traditional look and is sturdy enough to hold most wide-screen TV’s? 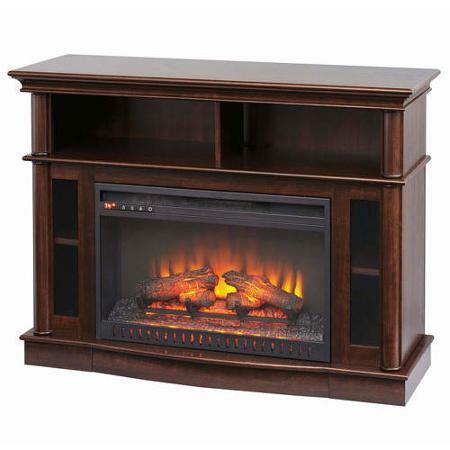 You might want to check out the ChimneyFree Wallace Infrared Electric Fireplace Entertainment Center. It has everything: the looks, the size, the sturdiness, and of course a fireplace that can heat up the room with an interesting array of flickering flames. At 60” wide, this entertainment system can even some of the largest display devices. Between the mantle-top and the fireplace is a small shelf that will carry several of your media players, and it’s the perfect place to store DVD players, Blu-ray players, video game consoles, cable boxes, or anything else that you can think of. There are side cabinets flanking the fireplace with attractive glass lining the outside, so that you can see exactly what you stored without having to go through the trouble of opening the doors. In these cabinets feature adjustable shelves inside, and you can store all sorts of media accessories; there’s plenty of room for your DVD’s, Blu-rays, video game disks or cartridges, or even video game controllers and TV remotes (if you can find them between the couch cushions). Speaking of remotes, the electric fireplace will follow your command from anywhere in the room with the included remote, so you never have to get up in the middle of your favorite show to adjust any of the settings. You can set the heater to your desired level, change the flames to suit your liking—you can adjust both the brightness (3 levels) or the various colors (2 colors, orange alone and orange with blue)—or set the timer to turn off after you’ve fallen asleep. This automatic timer function can be set to a time between ½ hour and a nine hours into the future, so you never have to worry about the heater running when you don’t need it, even if you’re not there to turn it off. With all of these features, and its large, sturdy cherry wood build, you can’t really go wrong if you’re looking for an entertainment center that will hold a big TV. In addition, this unit comes with a one-year warranty. 60″ W x 33.75″ H x 20″ D in size. Has 3 flame intensity levels and two color schemes. Looking for an entertainment center with an electric fireplace inside that matches your furniture, but can’t find one with a dark enough shade of wood? 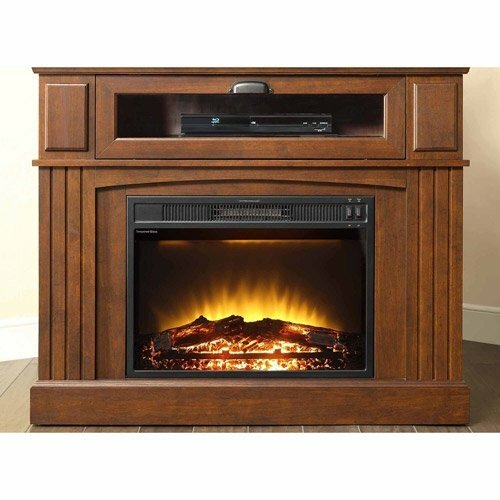 Try the Merrill Media Electric Fireplace Heater Ventless Merlot; it is just the sophisticated entertainment system you’ve been looking for, a media fireplace with dark wooden cabinets that will match any room that is furnished in darker, more dramatic colors. This fireplace doubles as a media center and can accommodate flat-screen TV’s that are up to 58” in width, which makes it a very functional, multi-use pieces of furniture that would be perfect for any room that needs a touch of class and a little bit of extra, inconspicuous storage. Not only is this unit useful, though, it is also very aesthetically pleasing to the eye, with its classic look and Merlot finish—which is painstakingly hand-applied, but the way. As with most entertainment centers, there is plenty of space to store all of your goodies, including a center shelf just above the fireplace where you can place all of your media players, game consoles, and cable boxes, and two side cabinets where you can place all of your media. The cabinets contain four shelves each, so you’ll have all sorts of compartments to keep your stuff. The fireplace heater can keep a room of about 400 square feet warm, though you can of course optionally just stare at the flames with no heat. The flames can be adjusted into 3 different intensity settings, and the temperature can be adjusted within 10 different heat settings. Like a lot of high-quality electric fireplaces, there is also a timer that you can set that will automatically shut the unit off at a specified time, which you can set from ½ hour to up to 9 hours; this is convenient if you’re planning to go to sleep next to your fireplace. All of these mechanisms can all be controlled by the included remote, and a small display on the face of the fireplace itself will show you where all of your settings are, so that you’re never confused. 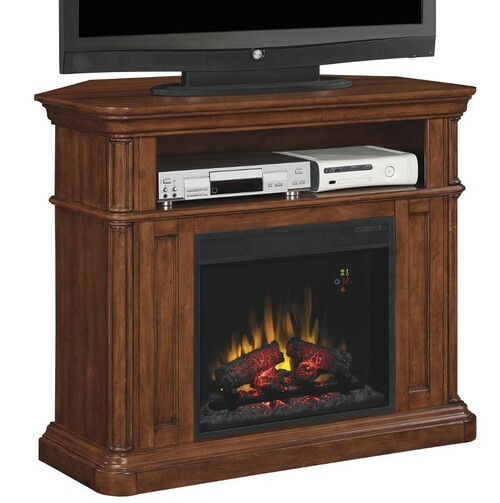 This media fireplace is easy to use, has no vent, and doesn’t require any special wiring. Simply plug it into the wall and you’re ready to start feeling the warming effects of your new, beautiful fireplace. 54 x 16 x 36.5 inches in size. About 128 lbs in weight. Includes 3 different flame settings and 10 different heat settings. There’s nothing like the smooth feel of a well-crafted wooden piece of furniture, especially when it has so many uses. Hold your TV, your media players, your media accessories, and your fireplace all in one place as you enjoy your relaxing evenings at home by the light of artificial fire. 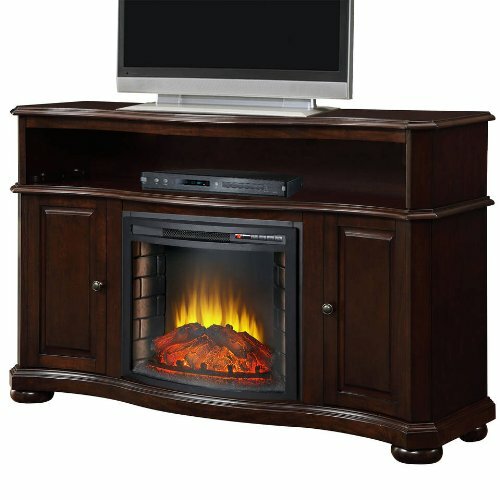 This media fireplace unit in particular is notable for its extremely realistic flames and burning embers. The logs “burn” with a satisfying reddish glow as orange flames rise above the virtual fuel, all while heating up your living space without a single ounce of smoke or the slightest bit of mess. Get the best of all worlds with the ultimate convenience of this 2-and-1 fireplace and media center. It’s everything you will ever need in your living room in a single, attractive package that is sure to get the attention of your friends and family alike. First of all, the whole fireplace and mantle is very simple to assemble, and once you’re done with that initial set-up, you simple plug your new fireplace into a standard outlet and you can begin using it right away. You will be stunned by how great the flames look, and you’ll have the option of three different levels of intensity and two different colors for the mesmerizing fire. The resin logs at the bottom of the hearth add to the authenticity and look surprisingly real. The heater works great, has a decent fan to push the heated air around, and can supply a room of 400 square feet with substantial heat. Use it to warm the cold areas of your house, or simply use it in the same fashion as any space heater, to keep warm during the colder days of the year. Optionally, you can also turn the heat off and watch the flames alone when you feel like mediating in peace—and the flames do have a tendency to hypnotize. 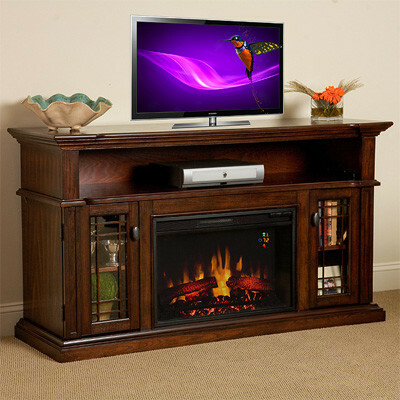 The mantle itself has many uses: The top can hold a TV of up to 50” wide, so it has quite good capacity. In addition, there’s plenty of storage space in the middle shelf of the entertainment center for all of your media devices and accessories. It does not include side cabinets like other similar entertainment centers, but it makes up for this with the sleek, attractive lines of its corners and its appealing birch finish. 43” W x 36” H x 28” D in size. About 89.5 lbs in weight. Can accommodate a television of up to 50” in width. Can heat a room of up to 400 square feet. Sometimes, you just need something in a simple brown shade to match the traditional look of the rest of your furniture. If you’re looking for the perfect entertainment system that sports not only an attractive finish, but has the kind of of simple style, with simple lines that blends in with the rest of your décor, then you might do well to consider this particular fireplace. User ratings are generally very high for this fireplace, and its an extremely good value for the price. Some remark that the fireplace, though simple in look, has a robust, quality appearance that is comparable to fireplaces 5 times its price. Just because you’re upgrading your living room with a new TV stand and a new fireplace all at the same time doesn’t mean that you have to pick a loud-looking or complicated unit. This quality device will do the trick, both in terms of functionality and in terms of looks. The mantle itself has a very geometric look to it, and inside its box-shaped middle shelf you can find plenty of space for all of your media devices. These would sit right under the mantle-piece where your TV would stand (and, by the way, it can hold a television of about 45” in width with no problem, and up to 100 pounds of weight). Further down is the focal point of the media center—and perhaps, depending on your furniture configuration, the room—which is the strikingly beautiful fireplace with realistically burning flames. The artificial logs lay in an almost horizontal position, allowing the virtual yellow flames to flicker like a rising sun over them. It really is a great replacement for a traditional fireplace. The heat controls on this fireplace are as simple as its aesthetic design: it offers an on and off switch, and it is a similar case with the flame controls. It can heat up a room of up to about 400 square feet in area, so it will work with most bed rooms, living rooms, and offices. It’s also a fairly easy set-up to assemble. 100 x 26 x 41 inches in size. About 108 lbs in weight. Can warm a room of about 400 square feet. Very simple heat controls / flame controls. Can carry at TV of up to approximately 45” in width.